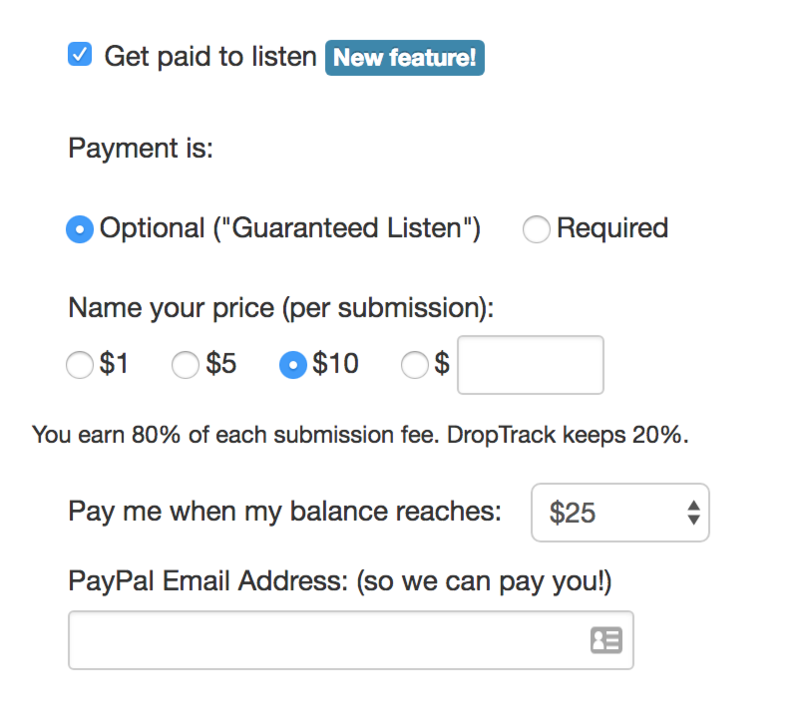 With DropTrack, you can receive music (demo submissions, promo submissions, etc. ), and optionally get paid for listening. You’re already listening to music submissions, now you can get paid for it. Unlock a new revenue stream! 1. In your DropTrack account, visit the Demo Settings page. 3. Now you can edit settings for your music submissions, and use our links and embeddable HTML Code to drive traffic to your submission page. You can specify submission instructions, get notified when a new song is submitted, set a limit on the number of submitted tracks, set your preferred genres, and toggle your appearance in the public directory. Note: For the best visibility in the public directory, be sure to edit your branding and upload your logo! 4. To enable paid submissions, toggle “Get paid to listen“. You can specify whether payment is Optional or Required, and name your price per submission.